Gravestone and Cemetery Care, an instructional program by Marianne Greenfield of Gravestone Cleaning Service, Delhi, has been set for Sunday, March 24th at 1 pm at the Time and the Valleys Museum on St. Rt. 55 in Grahamsville, Sullivan County. Marianne Greenfield is the owner of Gravestone Cleaning Service and trained in gravestone and monument conservation. A twenty-three year member of the Association for Gravestone Studies, she leads gravestone cleaning and resetting workshops and cemetery walking tours for groups interested in historic gravestone and cemetery restoration and preservation. The Museum is located at 332 Main Street (St. Rt. 55) in Grahamsville Sullivan County. Adults admission is a suggested donation of $5, Children under 16 $2, and children under six are free.For more information call 845 985-7700, e-mail info@timeandthevalleysmuseum.org or visit www.timeandthevalleysmuseum.org. 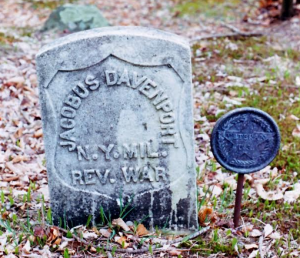 Photo of Revolutionary War grave provided by Time and the Valleys Museum.